High quality decals in perfect register; full colour instructions with four views of each subject; nice variety of colours and markings. 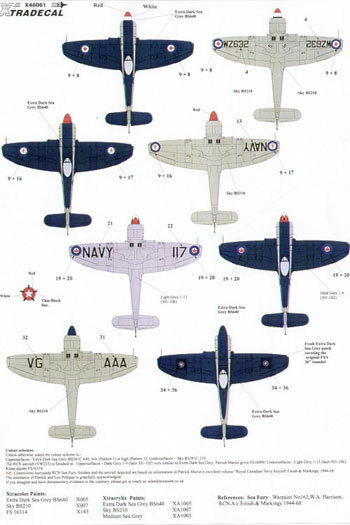 Xtradecal has recently released a 1/48 scale decal sheet for the Hawker Sea Fury FB.11, which will be suitable for either the new Trumpeter kit or the older Hobbycraft offering. 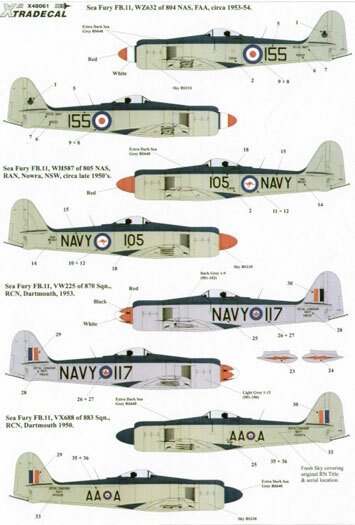 A nice selection of markings and colour schemes are included for British, Australian and Canadian Sea Furies. Three of the four subjects are finished in standard Sky lower surfaces and Exra Dark Sea Grey on the top of the wings, tailplane and aircraft spine. Sea Fury FB.11 VW225/117 870 Sqn. Royal Canadian Navy, Dartmouth 1950s. This Sea Fury is finished in the unique Canadian scheme of Light Grey lower surfaces and Dark Grey uppers. It also features a white star outlined in black on the spinner. There are no decals or guides for this star, so it will just be you, your masking tape and a steady hand to see you through! Very attractive scheme though. 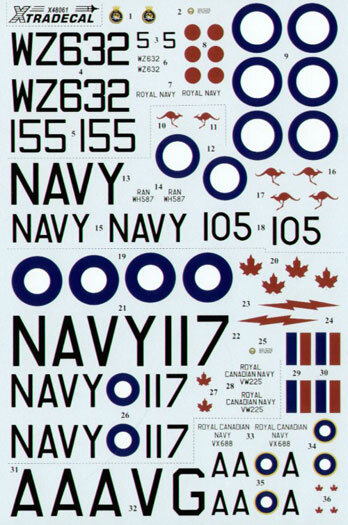 Sufficient national markings are supplied for both Canadian machines and one of the RAF and FAA Sea Furies. Stencil markings are not provided. The colours of the markings look spot on, as does registration on my sample. Decal film is nice and thin, and my previous experience with Xtradecals is that they are trouble free in application and quite opaque even over dark paint. Instructions are in full colour with large side profiles plus smaller top plan and bottom views of each aircraft. Colour notes are also supplied, along with model paint callouts for Xtracolor enamels and Xtracrylix acrylics. Whether you have an old Hobycraft kit in your stash (probably still a worthy contender), or you have bought the new Trumpeter kit with its bells and whistles, Xtradecal's new Sea Fury decal sheet will help individualise your kit on the competition tables or your display shelf.